Victory! Not gloom and doom. Understanding the Book of Revelation as it was originally written and as it was written for the present time. The Book of Revelation is not a book of doom and gloom but the victory of the Lamb of God and those who follow Him - The Overcomers. In this groundbreaking three-volume series, Dr. Richard Booker helps you understand the Book of Revelation by explaining John's vision within its intriguing original historical, literary, and biblical context. This book is what Jesus Christ revealed. God gave this revelation to Jesus to show His servants the things which must happen soon. Jesus revealed it to John, His servant, sending it through His angel (Revelation 1:1 PEB). * Reading Revelation within the context of its biblical Jewish roots. * Learning the historical and spiritual background of the seven churches (congregations). * Uncovering the archeological and geographical setting of the seven cities and congregations to whom the Lord is writing. * Becoming familiar with the literary style of the Revelation and apocalyptic writings of John's time. * Learning the influence of Greek mythology and Roman imperial cult worship. * How to live an overcoming life in the challenging days ahead. Written in a clear and reader-friendly style, this series is powerful, prophetic, practical, and personal. It is ideal for individual or group study. What did John’s revelations mean to the seven churches who read his letter? 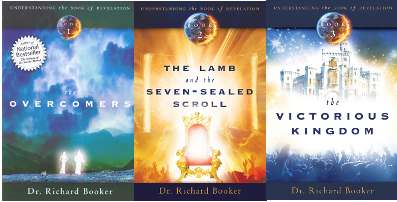 The Lamb and the Seven-Sealed Scroll is the second volume in Dr. Richard Booker’s powerful three-volume series. Continuing to examine the Book of Revelation within its original historical, literary, and biblical context, Dr. Booker turns his clear, prophetic explanation to the seven-sealed scroll, which contains the word of the Lord given to Daniel and is sealed until the time of the end. This seven-sealed scroll is God’s revelation of the events of the end times. Dr. Booker boldly challenges some traditional theology and provides biblical and modern-day support for his beliefs. How to read Revelation within the context of its biblical, Hebraic roots. The historical, spiritual, archeological, and geographic backgrounds of the seven churches. How to read the literary style of the apocalyptic writings of John’s time. The influence of Greek mythology and Roman imperial cult worship are a background to understanding the Book of Revelation. The connection between the context of the Book of Revelation and our world today. There is hope for believers facing the challenging days ahead. God will authorize who can loose the seals, open the scroll, and read His final prophetic word for humankind. Open this book for an inside look at the end times! The Book of Revelation is not a book of doom and gloom but rather the story of victory of the Lamb of God and those who follow Him. In this third book in a groundbreaking series, Dr. Richard Booker explains John’s vision within its original historical, literary, and biblical context.